When it comes to developing a budget for your printing costs it can be a bit of a struggle to get an accurate figure. This guide is designed to help you through the process and make sure you have considered all the factors and can generate an accurate cost so that you can plan accordingly. This is just the cost of your copier. It is the monthly equipment cost part of your lease agreement or the value of your purchased device divided by the number of months you have used it. This is usually the easiest information to obtain and is often the only thing some people take into consideration. This is the cost of supplies such as toner and paper etc. This is always an ongoing expense as supplies are consumed. If you are on a managed agreement then all this will come under your cost per click print costs for the month, apart from the cost of paper. Otherwise you may need to gather purchase records from half a dozen different sources to make sure all the costs of supplies are accounted for when calculating your spending. The cost of any services or maintenance done on your equipment is often an expense that is overlooked when deciding between purchasing and leasing. The service and maintenance is usually handled by the company from which you are leasing. However, if you have purchased your equipment you will usually have to pay out of pocket for these services so you will need to add the average monthly cost of service into your calculations. This is the cost in hours per month that your staff waste on printer-related hassles. It could be time spent waiting for a slow machine, finding availability and prices of supplies or your office administrator trying to find who to call when there is a problem. When adding up the costs for print you will need to estimate the time spent on these tasks and its dollar value to your business. As you use your equipment it degrades and its value depreciates. With proper service and maintenance the degradation is greatly slowed but it will still happen over time. 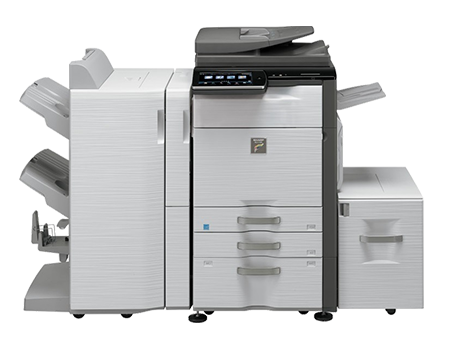 Even the best printers and photocopiers are only built with a designed lifespan of 5-10 years and keeping a printer running longer than that becomes more expensive than it is worth. In addition to that, technology is changing and advancing at an increasing rate and as newer and more advanced options become available, the value of your older equipment becomes proportionately lower. One way to avoid depreciation with age is to lease instead of purchasing. Leasing allows you to use the equipment until it degrades to a point where efficiency declines, then you can upgrade to a newer and more advanced model. Even when you know the right place to look, all this information can be difficult to gather and quite time consuming. With assistance from experts in the industry that time and effort can be greatly reduced. With an office technology assessment from an expert you can determine the true cost of ownership and see where cost savings are available.